In this post, I will make a complete list of every single currently unanswered question in the Kingdom Hearts series and universe. Please comment down below all unanswered questions / "plot holes" you can think of and I will add them to this list. Hopefully we can fill it out together and create a truly complete list. Hopefully they answer most if not all of these in Kingdom Hearts III or any future interviews. Why are there globes and maps of Earth and real world locations in some worlds? Are some worlds just alternate reality-type Earths that exist simultaneously but separately? Or did all the worlds used to be Earth when they were all together in one massive World in the Age of Fairy Tales, and the globes and maps are just artifacts of history? In the first Kingdom Hearts, how did Mickey know about Sora and Riku, and how did he know that they got a Keyblade? Yen Sid has the ability to sort of sense things and people in other realms and worlds, so did Yen Sid tell Mickey about them? In the first Kingdom Hearts, why does Winnie the Pooh's letter to Rabbit have "Mickey Mouse" written on the front with a crown symbol? Also, if you come back later, it'll instead be a letter from Roo. This letter also has "Mickey Mouse" written on the front with a crown symbol. Why is that? 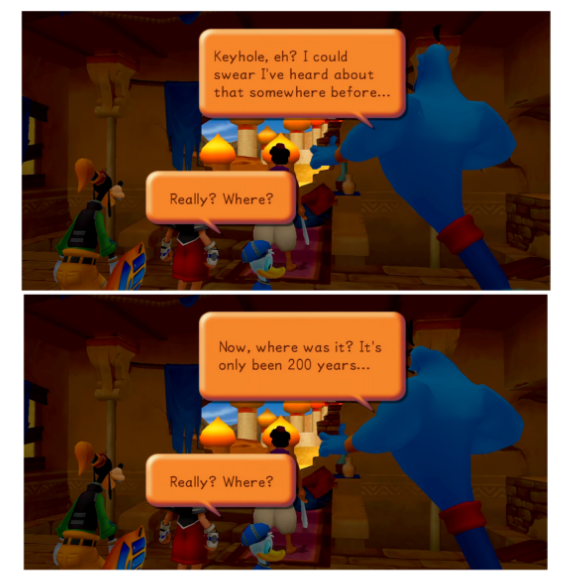 In the first Kingdom Hearts, Genie says he's heard about a Keyhole before 200 years ago, and implies that he used to know its location. Why does he know about the Keyhole and how did he know its location? Some residents of Halloween Town, such as Jack, The Mayor, Dr. Finkelstein, etc. all know about the Heartless because Jack found a book about the Heartless. Who wrote this book full of research notes? Why didn't Maleficent getting stabbed with the Keyblade of Heart cause her to turn into a Heartless? Why did she turn into her Dragon form instead? The Keyblade of Heart has the ability to "unlock people's hearts," which sounds like the same thing that any Keyblade can do if you're on the level of a Keyblade Master, so it can be assumed that the unique ability of the Keyblade of Heart is that it allows you to do that without being on the level of a Keyblade Master. But, is it possible that "unlocking people's hearts" is actually different? Could "unlocking people's hearts" something different for each person who gets stabbed by it? Such as Sora turning into a Heartless, and Maleficent turning into her Dragon form? Or is it that Maleficent is just different than most people and follows different laws of nature? In the first Kingdom Hearts, Xehanort's Heartless possessed Riku, which sort of kicked Riku's heart out of his body and sent it to the Realm of Darkness. Why didn't this create a Heartless and a Nobody? Was it because the heart wasn't either extracted by a Keyblade or succumb to the darkness? When a Heartless is destroyed by a Keyblade, whether it be an Emblem Heartless or a Pureblood Heartless, a heart is released from it and the original person is recompleted. (For the Pureblood Heartless, the heart isn't visibly released, but it's still released.) If someone has a Nobody too, you have to destroy that as well in order to get their original self to be recompleted. If a Heartless is destroyed by something other than a Keyblade, then the released heart will end up just eventually turning back into a Heartless. So, when Ansem, Seeker of Darkness was destroyed by the light from his artificial Kingdom Hearts (and Xemnas was destroyed later), why did Xehanort get recompleted? He shouldn't have gotten recompleted since his Heartless wasn't destroyed by a Keyblade, it was destroyed by the light from his artificial Kingdom Hearts. Does getting destroyed by Kingdom Hearts count as getting destroyed by a Keyblade for some reason, or have the same effect as getting destroyed by a Keyblade or something? What was written on the letter that Pluto was holding at the end of the first Kingdom Hearts and in the beginning of Kingdom Hearts Chain of Memories? It's obviously not the same one from the end of Kingdom Hearts II since Mickey wrote that at the end of Kingdom Hearts coded. At the end of the first Kingdom Hearts, how did Donald and Goofy's clothes change when they got to the grassy area outside of Castle Oblivion? Also, how did their clothes change while they are in Castle Oblivion in Kingdom Hearts Chain of Memories back to the clothes they had on before? In Kingdom Hearts Chain of Memories, when referring to Maleficent, Vexen says "Don't be absurd. The witch is gone. She cannot return from the Realm of Darkness of her own volition." This means that after Sora destroyed Maleficent in the first Kingdom Hearts, she got sent to the Realm of Darkness. Why is this? Why did Maleficent get sent to the Realm of Darkness instead of just simply dying? Or did she just simply escape after the battle with Sora to the Realm of Darkness using a Corridor of Darkness? Also, why did she have to wait for someone (the three fairies) to remember her in order to come back when she could've just used a Corridor of Darkness to get out? Why can she not escape of her own volition? When Ansem the Wise was banished to the Realm of Darkness by Apprentice Xehanort, he was able to use Corridors of Darkness to get out, so why couldn't Maleficent have done that? Why did Marluxia and Larxene want to overthrow Organization XIII? In Secret Ansem's Report 12, it says "First I shall convert all of Twilight Town into data and construct a "world duplicate" in Sora's memories. I shall place Roxas within that world to live out his days and regain those memories." If the simulated Twilight Town that Roxas was placed into is located inside of Sora's memories, then how was Sora able to go inside of the simulated Twilight Town by accessing the machine in the basement of the Old Mansion in Twilight Town near the end of Kingdom Hearts II? Is there multiple copies of the simulated Twilight Town, and just one of them is located inside Sora's memories? Or were Sora's memories just hooked up to the simulated Twilight Town before or something? Or is the machine in the basement of the Old Mansion just simply able to access Sora's memories and by going into the simulated Twilight Town, Sora was within his own memories? Why did the guards in Land of Dragons turn into Emblem Heartless (Nightwalkers)? If they were succumbing to the darkness, then they should've turned into Pureblood Heartless. Were they just Nightwalkers disguised as guards or something? How did the Ghosts of Scar form together to create an Emblem Heartless (Groundshaker)? Shouldn't they have created a Pureblood Heartless if anything? Did they just form together with a Living Bone and Shaman Heartless or something? How did Stitch get to Hollow Bastion? Why did Axel and SaÃ¯x want to find the Chamber of Waking? Why did Axel and SaÃ¯x want to overthrow Organization XIII? How did SaÃ¯x get his scar? What are the names and identities of Larxene, Demyx, and Luxord's original human forms? Why hasn't Xemnas wielded a Keyblade? (Assuming he has the ability to). If he doesn't have the ability to wield a Keyblade, then why? How did Ansem the Wise's machine exploding turn Riku back to normal and how did it transport Ansem the Wise to the Realm of Darkness? Why did NaminÃ© return to Kairi, when she's made out of Sora's body and soul? Shouldn't she have returned to Sora instead? Did she have some of Kairi's memories that needed to return to her, the same way Roxas had some of Sora's memories that needed to return to him? If not, then why did NaminÃ© even need to return to anybody? Why does Apprentice Xehanort have brown eyes instead of yellow? Why does Xemnas and Ansem, Seeker of Darkness have orange eyes instead of yellow? Why does Riku not have yellow eyes in the first Kingdom Hearts when Ansem, Seeker of Darkness is possessing him? How did Sora and Riku get from the place where they fought the final fight against Xemnas in Kingdom Hearts II to the Dark Margin in the Realm of Darkness? How did Kairi's message in a bottle end up at the Dark Margin? "End of Sea" is the name of a world that's half in the Realm of Darkness and half in the Realm Between. Dark Margin is a location at the very tip of this world. It's on the Realm of Darkness half of the world. The ocean that we see there acts as a border between the Realm of Darkness and the Realm Between. How are there worlds in the Realm of Darkness still? They should've all returned to the Realm of Light after Sora sealed the Door to Darkness and Ansem, Seeker of Darkness' artificial Kingdom Hearts broke apart. Does this mean there are worlds native to the Realm of Darkness that have always never had a heart? Or is End of Sea just a world from the Realm Between that's so close to the edge of the Realm Between that it's also touching the Realm of Darkness? Also, how is there a world that's half in one realm and half in another realm in the first place when the realms aren't physically connected? How did Mickey's message in a bottle get to Sora on Destiny Islands? Tetsuya Nomura has stated that Ventus' heart stayed within Sora's body AKA his Nobody, Roxas when Sora was separated from his body and soul and became a Heartless. What is the reason for this? Why didn't it get released along with the other hearts? How did Ventus become so tiny when he went to Castle of Dreams? Tetsuya Nomura said it was because he somehow messed up traveling to the world and ended up tiny, but how does that even happen? How does you not knowing how to properly travel to worlds make you end up very small? I assume that we just simply don't completely know how physics and stuff works in the Kingdom Hearts universe, but it'd be nice to get a specific answer to this question. How is the ship in Deep Space able to access the Lanes Between without a Keyblade or Corridors of Darkness? Or does this mean that somebody aboard the ship has a Keyblade or the ability to use Corridors of Darkness? Where did Vanitas obtain his Keyblade? He can wield a Keyblade because his heart is half of Ventus' heart, but where did he obtain his Keyblade, Void Gear? Did Xehanort Bequeath him? Or does he wield Wayward Wind, except with a Void Gear Keychain on it? If the Unversed are created by Vanitas and come from Vanitas, then how was Lady Tremaine able to turn the coach into an Unversed and how was The Queen able to turn the Spirit of the Magic Mirror into an Unversed? Why did Lea and Isa go into Ansem the Wise's castle in Kingdom Hearts Birth by Sleep, and why did they get kicked out? How did Ventus and Aqua end up in the Lanes Between after their battles at the Keyblade Graveyard? How did Terra-Xehanort end up at Radiant Garden after the explosion from the Ï‡-blade? Did Terra-Xehanort/Apprentice Xehanort actually have amnesia or was he just faking it? When Terra-Xehanort split himself up into a Heartless and a Nobody, why weren't two Nobodies created? When Sora became a Heartless, his own heart and Kairi's heart released from his body. This created Roxas and NaminÃ©. When Terra-Xehanort became a Heartless, the same thing should've happened. Terra's heart and Xehanort's heart were released from Terra's body. This should've created a Terra Nobody and a Xehanort Nobody, but instead, Xemnas was created; someone who is a mixture of both Terra and Xehanort. Why? How did Young Xehanort leave Destiny Islands and get to Land of Departure? When we see Young Xehanort in the past on Destiny Islands and in the present-day during Kingdom Hearts 3D: Dream Drop Distance, he doesn't have pointy ears like he does when he's older. Why is this? And when we see Young Xehanort in Kingdom Hearts III, he does have pointy ears. Why is that? Why does Xehanort's Keyblade Armor have the Nobody emblem on it? How did Riku obtain his second Keyblade (Way to the Dawn) after Sora took his first one (Kingdom Key)? Getting Bequeathed causes a Keyblade to choose you, so when Sora took his Keyblade, did another Keyblade choose him? Is that what happens if you lose your Keyblade somehow? Another one will choose you? The Master of Masters forged and tempered Keyblades by pulling them out of the depths of hearts. And ever since then, if you are Bequeathed, a Keyblade will choose you. If all Keyblades already exist somewhere out there and were created long ago, then how come some people's Keyblades resemble them or their character/personality? For example, Lea's Keyblade resembles one of his Eternal Flames Chakrams with fire coming out of it and Riku's Keyblade resembles his Soul Eater sword. Is this just simply because these people are destined to wield these Keyblades or something? Where did Riku get the Keyblade he gave to Kairi (Destiny's Embrace)? And why did he even have to give her a Keyblade in the first place since one should've already chosen her since she was Bequeathed? Doesn't this mean she has two Keyblades now: the one that chose her from her being Bequeathed and the one Riku gave her, Destiny's Embrace? What's the name of Lea's Keyblade? Why does the Kingdom Key look exactly like the two blades that are a part of the Ï‡-blade? 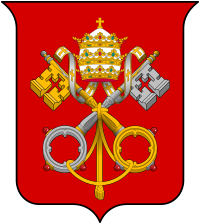 It was stated that the pieces of light of the Ï‡-blade were split into seven pieces to protect the number of pure hearts in the world. This is referring to the Seven Princesses of Heart. The Seven Princesses of Heart didn't exist way back in the Age of Fairy Tales though, so how did the Ï‡-blade know that they were going to be born in the future? And in what way are the seven pieces of light protecting the Seven Princesses of Heart? While Aqua was carrying Ventus' comatose body, his Keyblade raised and opened a door that led them to the Land of Departure. This door was not a method of travel that we've ever seen or heard about before. It wasn't one of the portals they've been opening with their Keyblades, it wasn't a Gate, and it wasn't a Corridor of Darkness. It looked pretty much exactly like the Door to Light from the end of Kingdom Hearts II. So, what was this door? Was it the Door to Light? And how was Ventus able to open it? At the end of the first Kingdom Hearts, Sora, Donald, and Goofy ere standing on a piece of land at End of the World. End of the World was a world located in the Realm of Light that's made up of chunks of worlds that fell to darkness. When a world is falling to darkness/falling to the Realm of Darkness, some chunks of the world might stay behind in the Realm of Light. These chunks formed together to create End of the World. Once Sora and Mickey sealed the Door to Darkness, Ansem, Seeker of Darkness' artificial Kingdom Hearts broke apart and the hearts returned to the worlds, and they were restored. They left the Realm of Darkness and went back to the Realm of Light. The chunks that made up End of the World also went back to the Realm of Light. The chunk of land that Sora, Donald, and Goofy were on was a part of the Land of Departure/Castle Oblivion world. So, when the worlds were restored, they got sent to the recompleted Land of Departure/Castle Oblivion world since they were standing on that chunk of land. But, this means that the Land of Departure/Castle Oblivion world fell to darkness sometime in the past. So, what happened to Ventus' body when this happened? Was it also sent to the Realm of Darkness with the world, and was safe from the darkness/Heartless, because he was in the Chamber of Waking? And does this mean that his body was sent back to the Realm Between with the world when it was restored? Why did Mickey not recognize the name "Xehanort" when he met Apprentice Xehanort? Is that just a common name in the Kingdom Hearts universe or something? What exactly is a "mind?" And how is it different from the "soul?" Is it even different from the soul or are they the same thing? Braig says he has his hands full with his own plans. What are these plans? In the Kingdom Hearts Re:coded "Destiny" secret ending, we see the Organization XIII members who were residents of Radiant Garden lying on the floor after being recompleted as complete people again. We also see Braig, who is not lying on the floor like the rest of them. He presumably woke up before them. (We know this Kingdom Hearts Re:coded secret ending takes place after Kingdom Hearts Re:coded and before Kingdom Hearts 3D: Dream Drop Distance because Ienzo is an adult in this cutscene. There is a cutscene at the beginning of Kingdom Hearts 3D: Dream Drop Distance that shows Even and Ienzo on the floor turning into Heartless/Nobodies and Ienzo is a little kid in that cutscene, so we know the Kingdom Hearts Re:coded "Destiny" secret ending takes place after Kingdom Hearts Re:coded because we know Ienzo grew up as an adult while he was a Nobody.) In Kingdom Hearts 3D: Dream Drop Distance, we see Xigbar. It is thought that this is actually Braig, not Xigbar and he's just going by the name "Xigbar" for some reason (most likely because of the Recusant's Sigil in that name). If this is the same recompleted Braig that we saw in the Kingdom Hearts Re:coded "Destiny" secret ending, then how come he has long hair again and how come he has gray in his hair again? It would not make sense for him to just all of a sudden change appearance and grow hair that quickly. Is this actually Xigbar and not Braig? If it's Xigbar, then that can either mean that he was brought to the present day from time travel, or that can mean that Young Xehanort turned the recompleted Braig back into a Nobody for some reason (maybe to be a more suitable vessel?). And is this the same case for SaÃ¯x? Was he turned back into a Nobody or was he brought back using time travel? Or it's possible that he's the recompleted Isa since his recompleted human form has no visible differences than his Nobody, unlike Braig and Xigbar. Speaking of which, do people keep their appearances that they had as Nobodies when they turn back into people, or are they reverted to how they looked before they were turned into Nobodies? This is very unclear. It seems that some parts of them did keep their appearance and some parts of them didn't for some reason. Ienzo, Lea, and Isa aged as Nobodies and kept their ages when they turned back into people. Lea lost the markings under his eyes when he became a person again though for some reason. From what we know, this is how it is: You are reverted back to how you looked before you became a Nobody, but you keep your age. For example, Lea was reverted to how he looked before he became a Nobody which is why he lost the markings under his eyes, but he still looks older because he kept his age. Why did Lea and Isa get recompleted with their black coats on? Does that mean they were the only ones who were wearing black coats before they became Nobodies? Ienzo seems to have known this whole time that the original person can get recompleted if their Heartless and Nobody is destroyed, so when he was Zexion, why did he act like he didn't know? It has been confirmed that Axel, Roxas, Xion, and NaminÃ© all grew hearts. As seen with Roxas, if your Nobody grows a heart and recombines with your other pieces to recreate the original person, the heart that the Nobody grew will be trapped inside of you. Since Axel grew a heart of his own and has been recompleted, does this mean that Lea now has two hearts: his original heart and the heart his Nobody grew? Or did the heart that his Nobody grew combine with his original heart? If so, then why didn't Roxas' heart combine with Sora's? Would it be because Roxas had a completely separate personality and memories than Sora, while Axel had the same personality and memories as Lea? Tetsuya Nomura said that Nobodies don't age, but Axel, SaÃ¯x, and Zexion all clearly aged. Maybe you need a heart to age, and since Axel grew a heart, he didn't count as a regular Nobody so he aged? Does this mean SaÃ¯x and Zexion grew hearts as well? Do you need a heart to age? Where is Terra's heart and body? Is Xehanort still possessing it, but just making it look like his old man form, like how Ansem, Seeker of Darkness in the first Kingdom Hearts was still possessing Riku's body, but making it look like himself? What's the situation with Eraqus being inside of Terra's heart? After Terra-Xehanort split into a Heartless and Nobody, what happened with Eraqus' heart, and where is Eraqus' heart now? Why can't Sleeping Worlds dream about Heartless? All the "realm of sleep" is, is dreams. It can be dreams of people or dreams of worlds that have fallen to darkness/fallen to the Realm of Darkness, since worlds that fall to darkness, also fall to sleep, and they dream. So, since people can dream about Heartless and have them appear in the realm of sleep, then why can't worlds do the same? Heartless can be created in the realm of sleep by someone dreaming about a Heartless in their dream, but Heartless can't enter the realm of sleep from the outside world. If Heartless can't enter the realm of sleep, then how was Ansem, Seeker of Darkness able to enter the realm of sleep? Is it because he's not just a Heartless, he's a Heartless possessing a body (Riku's body form the first Kingdom Hearts)? Does him having a body allow him to enter the realm of sleep? Also, why can't Heartless enter the realm of sleep in the first place? Why can't they just use Corridors of Darkness to enter? Young Xehanort, and the other Seekers of Darkness, follow Sora and Riku into the realm of sleep. They use that as an entrance. But, I'm still pretty sure that Corridors of Darkness can get you into the realm of sleep since they were all using Corridors of Darkness while in the realm of sleep. That's also presumably how they got out of the realm of sleep when they were done putting Sora into that weird sleep coma. Presumably. So, yeah, why can't Heartless use Corridors of Darkness to enter the realm of sleep? Who are all of the Seven Guardians of Light? Who are all of the Thirteen Seekers of Darkness? Why did the time traveling members of the Thirteen Seekers of Darkness have to go back to their own time? And how are they going to come back? The Kingdom Hearts Ultimania states that Xehanort's heart being in thirteen vessels serves as raw material for the Ï‡-blade. Why is this? Xehanort's heart isn't pure darkness, so how does him putting his heart into thirteen vessels work for creating the Ï‡-blade? What was the Riku that Riku saw in Monstro in Kingdom Hearts 3D: Dream Drop Distance? Was it the dream world projecting an image of Riku from the first Kingdom Hearts? Putting Riku "back in his place," like it did to Jiminy in Sora's side of Prankster's Paradise? If so, then why is he wearing a black coat? Riku wasn't wearing a black coat in the first Kingdom Hearts, and the worlds only dream about their pasts, so this wouldn't make sense. Is it a Seeker of Darkness? If that Riku is a Seeker of Darkness, is it Riku Replica? If it's Riku Replica, then why did Riku say "That was my... my dark side. I gave into the darkness once, and ever since, it's chased be around in one form or another. The seeker of darkness who stole my body, a puppet replica of the shadows in my heart, and now, I'm facing me."? He lists the versions of his darkness that have chased him around in one form or another. He lists Ansem, Seeker of Darkness and Riku Replica, and then says that now, he's facing himself. That implies that it's not Riku Replica. So, it's not Riku Replica, right? Unless Riku's just assuming it's not Riku Replica. If it's just himself (Riku) that he was facing, then was it when he was a villain in the first Kingdom Hearts that's time traveled to present-day to be a Seeker of Darkness? If it's Riku Replica or himself from the first game time traveled to present-day to be a Seeker of Darkness, then how come Young Xehanort isn't there with him? Tetsuya Nomura has stated that Young Xehanort functioned as a "portal" that summoned the Xemnas and Ansem, Seeker of Darkness. Wouldn't it be the same for Riku Replica/Riku from the first game and any other time traveling Seekers of Darkness? If not, then why? How are we going to save Ventus, Terra, Roxas, Xion, and NaminÃ©? What is the Key to Return Hearts? In the Kingdom Hearts 3D: Dream Drop Distance secret ending, Goofy says that Lea hurried back to Radiant Garden. Why did he hurry back to Radiant Garden? It was shown that the "illusion" of Terra we see in Kingdom Hearts 0.2 Birth by Sleep -A fragmentary passage- was there because of NaminÃ©'s help. This took place right after Sora went into the pod to restore his memory, so why/how did Kingdom Hearts 0.2 Birth by Sleep -A fragmentary passage- end with how the first Kingdom Hearts game ended? 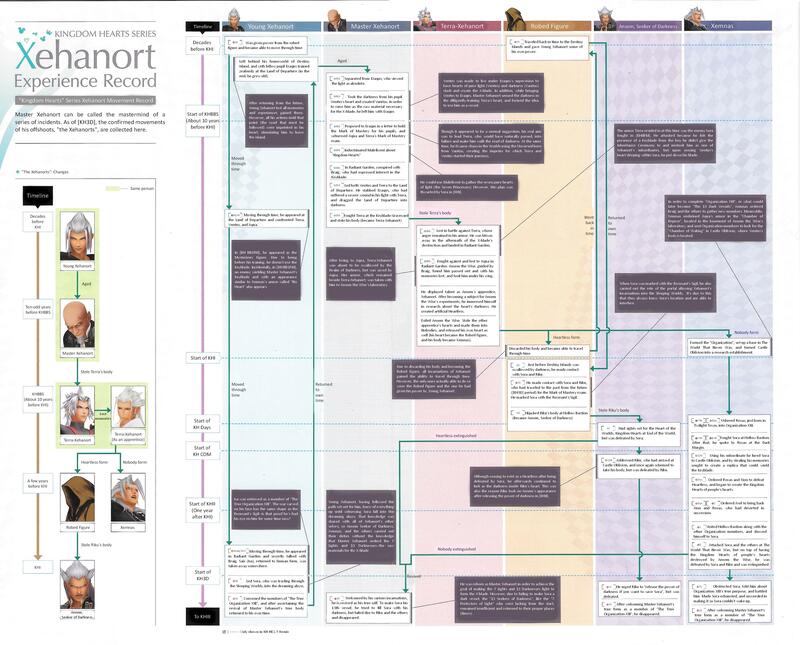 How does that make any sense timeline wise? Why did the illusion of Ventus we see in Kingdom Hearts 0.2 Birth by Sleep -A fragmentary passage- have a black and white checkered design on the back of his jacket rather than the half black half white design the back of his jacket usually has? If the dark counterpart of Keyblades of Light (Keyblades of Darkness) are found on the dark side of the world the Keyblade of Light was gained at, then does that mean Keyblades of Darkness are only created when a world that a Keyblade of Light was gained at falls to darkness? Or are Keyblade of Darkness counterparts to Keyblades of Light created in the Realm of Darkness right when a Keyblade of Light is gained, but just teleports to the world the Keyblade of Light was gained at when it falls to darkness? How did Aqua and Mickey end up at the Realm of Darkness area that was behind the Door to Darkness? There was just a flash of light and then they got teleported there. What was that flash of light from and how did they get teleported there? Was it the flash of light that came out of the Door to Darkness when Sora said "Kingdom Hearts is light" in the first Kingdom Hearts? How did Mickey get his shirt back in time for Kingdom Hearts Chain of Memories after it got destroyed by the Demon Tide? How long ago does Kingdom Hearts Ï‡[chi] take place? We know that the Age of Fairy Tales takes place "more than a hundred years before Sora received the Keyblade," but "more than a hundred years" is a very vague number. What is the name and identity of The Master of Masters? What were the Foretellers' and Luxu's original names before The Master of Masters gave them new names and what do their faces look like? What are the names of all of the Foretellers' Keyblades? Who is Xehanort and Eraqus' master? Is it Luxu, or was there another generation in-between them and Luxu, or even more? Also, was this Yen Sid's master as well, or did he have a different master? If so, then who was Yen Sid's master? What's in the black box that The Master of Masters gave to Luxu, and why isn't Luxu allowed to open it? How was The Master of Masters able to see the future with the Gazing Eye when it wasn't even passed down yet? Wouldn't that just be him looking into the present since he has to wait until it's passed down? Why did The Master of Masters disappear? How do the Dandelions survive the darkness that covers the World after the Keyblade War? How does Luxu survive the darkness that covers the World after the Keyblade War? If The Master of Masters only put his one eye on one Keyblade, then how are there so many eyes on so many Keyblades in the future? Who Bequeathed Ventus, the Player, Ephemer, Skuld, Brain, and all of the other Keyblade wielders from the Age of Fairy Tales? How did Ventus and Lauriam get from the Age of Fairy Tales to the time period of Kingdom Hearts Birth by Sleep? How was present-day Maleficent there in the Unchained realm during the Age of Fairy Tales during the Kingdom Hearts Ï‡[chi] secret ending? How did the light from children's hearts recreate the World? Do children's hearts just simply have the ability to create an entire universe? Or was Kairi's Grandma just being vague in her story? If so, then what really happened? If you'd like to know more about the Braig/Xigbar situation talked about above, check out my explanation on the whole situation here. How did King Triton know about the Keyblade? If this never is given an actual answer, I think we can sort of imagine that he knew of it simply by the legends that are heard and passed down. KH1 itself even talks about how there are two legends about the Keyblade, one in which its wielder brought peace and another in which he brought ruin. It's possible Triton had only heard the latter legend and came to believe it to be true. Why was the enemy that was chasing and attacked the man in Traverse Town invisible? Since he turned into an Emblem Heartless, it was most likely an Emblem Heartless that attacked him and stole his heart, but why didn't they animate it? Why was it just invisible? I don't really think this has any deep significance, and I wouldn't really classify it as an unsolved mystery. I think it's just stylistic choice to help demonstrate to the player that the Heartless are made from stolen hearts, and is presenting that in the clearest way. In the beginning of KHCOM/KHRe:COM, what exactly was written on the letter that Pluto was holding? It's unlikely we will ever know the specifics of the letter, because it seems not to be all that important. In KHII Minnie reveals that Mickey has sent her many letters talking about Sora, and it's implied he used Pluto to deliver them. Are the Heartless that appear in KHCOM/KHRe:COM real Heartless or are they fake Heartless created from the cards made from Sora and Riku's memories? In KHII, why doesn't Sephiroth recognize Sora? Because the fight in KH1 was made non-canon. If Keyblades were forged long ago, then how were Riku and Lea able to create their own Keyblades that are based off of their previously wielded weapons? I'd imagine their hearts created keychains that represent their old weapons/selves and that's what give their Keyblade that look. But, we also know there are as many Keyblades as there are qualified hearts to wield them, so I don't think it's quite a case of all existing Keyblades being forged a long time ago and that's it. Do you physically find Keychains on the ground and in chests or are they objects formed by your heart and the bonds of your heart? Or both? They seem to be both. Where do Keychains come from? Did they all once belong to a respective Keyblade, but just fell off or got lost? Or are they forged separately as special accessories? This is kinda the same question as above, no? Why hasn't Xemnas wielded a Keyblade? (Assuming he has the ability to). Xemnas was trying to find the Chamber of Waking. How did he know that the Chamber of Waking exists? Neither Xehanort nor Terra have ever known about its existence, so how did Xemnas discover that it existed? Some have suggested that Aqua's armour is a lingering sentiment and told Xemnas, but that seems pretty ridiculous to me. But it is the only other real explanation. I suppose another is that perhaps Master Xehanort knew of the Land of Departure's ability to transform into CO, and once he saw that it had, believed that to be the only possible location to where Ven is? When Roxas dual-wielded, why did he spawn two Kingdom Keys instead of the Kingdom Key and the Wayward Wind? Good question. A pretty awful choice if you ask me, just leads more people to believe the second Keyblade is Xion's. The χ-blade split into 13 pieces of darkness and 7 pieces of light. The 7 pieces of light became the 7 Princesses of Heart. So, what happened to the 13 pieces of darkness? The seven pieces of light did not become the Princesses of Heart. The Princesses of Heart are what caused the light half of the X-Blade to break into seven. They exist separately. Why does the Kingdom Key look exactly like the two blades that are a part of the χ-blade? Similarly, why does the Kingdom Key D look very similar to the two blades that are a part of the χ-blade? It remains to be seen if they have any deeper significance, but it's mostly done to be a Keys of Heaven reference. Is Ends of the Earth the new base form of Terra's Keyblade, or is it simply just a Keychain? Is Stormfall the new base form of Aqua's Keyblade or is it simply just a Keychain? If the Unversed are created by Vanitas and come from Vanitas, then how was Lady Tremaine able to turn the coach into an Unversed and how was The Queen able to turn the Magic Mirror into an Unversed? The Unversed are made from, and drawn to, Negative Emotions. I think we're meant to believe that Lady Tremaine's negativity drew the Unversed to her and they possessed the coach, not that she personally did it. I don't think we're led to believe the Queen turned the Magic Mirror into an Unversed? She used magic on it to give it other powers. In KHBBS, Why did Lea and Isa go to Ansem the Wise's castle Were they applying for a job or something? They wanted to try and break into it. We have no reason to think there is any deeper significance to it at this point, just a silly teenage prank. What are Save Points exactly? (If you didn't know, they are canon. Ventus has briefly mentioned one before). It's just a gameplay thing. How does Sora, Donald, and Goofy get from the Gummi Ship to a world and from a world to the Gummi Ship? Are Save Points like strange warp stations made from light that they can beam up to the Gummi Ship from? I wouldn't really call this an unanswered mystery. We're led to believe they land somewhere off screen, and simply go back there when they leave. It's cut because it's not important, not because it's a mystery. In KHDDD, How and why was Destiny Islands a Sleeping World? They time traveled back to the night it fell to Darkness and became a Sleeping World (KH1). It falling into darkness is what made it a Sleeping World. If Space Paranoids is a copy of The Grid, then how was the Tron from The Grid (Rinzler) able to remember Sora if the Tron that Sora met in Space Paranoids is a copy? A testament to how hearts transcend any system. What did Young Xehanort mean by "Data does not dream, cannot dream. This world is real."? Up to that point, the worlds Sora visited were dreaming, and the events that transpired were taking places in those dreams. Thus, nothing Sora did really mattered because it was just a dream, a dream that would repeat itself endlessly until the world awoke. What happened to the people in the dream didn't matter because it was just a dream. What Xehanort was saying is that data is incapable of dreaming, meaning that the events that were taking place were actually happening -- Sora's actions would directly impact the people he met and the world as a whole because this wasn't a dream. In KHχ/KHUχ, who is the Unknown? If we're to take this translation of Nomura at face value, then the Unknown is the Master of Masters. --Though it’s already full of mysteries, it will deepen the mystery even further to guess who appears to be the Master of Masters. Nomura: In “KHx Back Cover”, there is quite a turn. By the way, in “KHx” they have appeared in a black coat. In KHχ/KHUχ, were the players, dandelions, Skuld, Ephemera, etc. all originally from Daybreak Town or were they all created by the Book of Prophecies? There's nothing in the story so far to suggest that they were made from the Book of Prophecies? -What is the origin of the Old Book? -Where is the Book of Prophecies now? -How are the Journal and Book of Prophecies linked? -What are the identities of the Foretellers? -What are the individual Foretellers seeking? -What is the significance of the lost page? -What is the purpose of the Dandelions/What Becomes of Them? -What is the Dalmatians’ original world? -What is Alice’s original world? -What is Bambi’s original world? -What is Dumbo’s original world? -What is Chicken Little's original world? -What is Jack Wilde and Judy Hopps' original world? Those are the ones off the top of my head anyway. What are you talking about? The Seven Princesses didn't exist in the age of fairy tales. The x-blade didn't break into 13 pieces of darkness and 7 pieces of light for any particular reason as far as we know, it just did. The 7 pieces of light later became the 7 Princesses of Heart. Yen Sid says it pretty explicitly, actually. The light divided into 7 TO protect the number of pure hearts left in the world, the princesses. They'd have had nothing to protect if those hearts weren't already existing. Check the 3D secret ending, dude. I don't think we're led to believe the Queen turned the Magic Mirror into an Unversed? She used magic on it to give it other powers. I think that's an error. The original Japanese game definitely seems to have had the Queen turn the Mirror into an Unversed. But in the English release, she just used a potion on it. I imagine they forgot to change the journal to reflect this. So I don't think we're meant to believe she did anymore. They likely changed it because they realized afterward that it didn't make sense for her to turn it into an Unversed (Japanese BBSFM also keeps the potion change). Lady Tremaine's Unversed bosses are also stated to have generated from her and her daughter's negativity. At this point, I hardly think it's a mistake or a deleted concept, especially since Aqua herself feel the Unversed's energy from Tremaine. And yet Terra is being told Unversed appeared only after Vanitas was spotted. My take is that Vanitas, willingly or not, is able to use nearby people's negativity to give birth to Unversed.